I saw someone else mentioned that this is like a com-rom for the YA age group and I have to agree, it is very much that while also holding very true to a very endearing coming of age story that we have all grown to know and love over the course of the YA genre in general. This holds true to popular YA tropes while still giving it a fun enough twist with detailing all of Claire’s past kisses and failed romances to make it something that is worth the time and effort of reading it. Be warned, there are mean girls and frenemies and bad boys and good boys (thankfully no real love triangle), drama and some angst and yes, lots and lots of kissing, there is even some skirting around of very serious topics (abuse and death). You might not even like the main character Claire during certain parts in the book and you will certainly love to hate Megan during most of it but yet, it still draws you into their friendship and story and still makes a teeny tiny small part of you root for them anyways. I can't explain it exactly but it does. Now on to the harder stuff. Did I love this? Did it blow me away and most importantly, would I really put it into the same category as Dessen, Ockler, Perkins and Colasanti's work like the synopsis suggests? To answer, no, no and absolutely not. If you go into this expecting something from them, something like them, you will be disappointed, but, that doesn’t mean this wasn't a good read, maybe even a solid read, it just means I personally, wouldn't put it into the same category as some of my favorites. Certainly not. But this was a good debut novel with some hard life lessons. Some lessons about forgiveness, friendship over love and about growing up and finding who you are and staying true to it. Whenever someone says that I won't like a character, I become determined to find out. lol. Well I'm glad you still liked it. Mean girls, definitely. I didn't enjoy this one nearly as much as you did, but I'm glad you were able to find things about the novel that you liked. It didn't live up to mentioned authors for me, either. Yeah definitely nothing like the authors mentioned. Thanks for the warning about Mean Girls - it's one that I detest in YA contemporary reads, so I'll probably skipping this one. Sounds like it was a cute romantic read for the YA crowd but that's about it. Great review. I don't usually like when they compare to other authors, it often leads to disappointment. I do like books like these sometimes but if it didn't really have a wow factor then I'll probably skip it. I know, I really think it does. You can't help but be excited by big names and then have high expectations. hmm I don't think this one is for me, I hate mean girls. It is nice though that this imparts some important life lessons. I agree but I really am over the whole mean girl thing but I did love this for the nice messages. I'm glad to hear this has a rom com feel and a good coming of age story, but it sounds like it might be too much mean girl drama for me, and if it's not as good as other authors who do this stuff really well, I might put it lower on my list. Thank you for your honest review! This sounds like a nice coming of age and what? no love triangle? LOL The rom com feel is unique, thanks for sharing your thoughtful review Ali. Have a wonderful weekend! 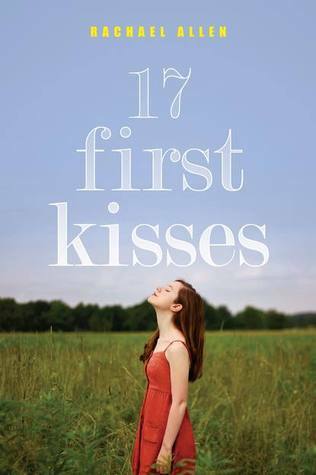 17 First Kisses sounds like a debut that's off to a good start. Coming of age stories can be tricky reads. Glad you enjoyed it overall, though. They really can be and truly, this wasn't a bad read at all, just not as good as I was hoping it would be. I've read mixed reviews about this one, and I don't think it would be something that's my 'cup of tea' :) Good review! I know, I am really starting to dislike that cliches in YA as well Becca. I almost requested this one. It sounds cute, but I am kind of glad that I didn't now. Your review is so helpful. The one thing I was worried about when I read the summary for this book was that I wouldn't like Megan. I don't really care for when friends fight over a boy and it ruins their friendship. But this one sounds really cute and I love that you say it is a ya rom-com. I am a sucker for those. thanks Michelle! That sort of thing really bothers me as well, I didn't like it in high school and I don't care for it now as an adult either. I'm sorry this didn't have a wow factor. I'm not a total fan of contemporary stuff, but I do read it once in a while. I have to admit that I hate mean girls. Gag. They always seem to dampen the story (obviously in the way they're suppose to) in a way that makes me like the novel less. I mean, I already hate the movie, Mean Girls, why would I read about them? I honestly didn't like that movie either and I see your point in not wanting to read about them in a book either. The Ghost Heart Kickstarter Is Here!